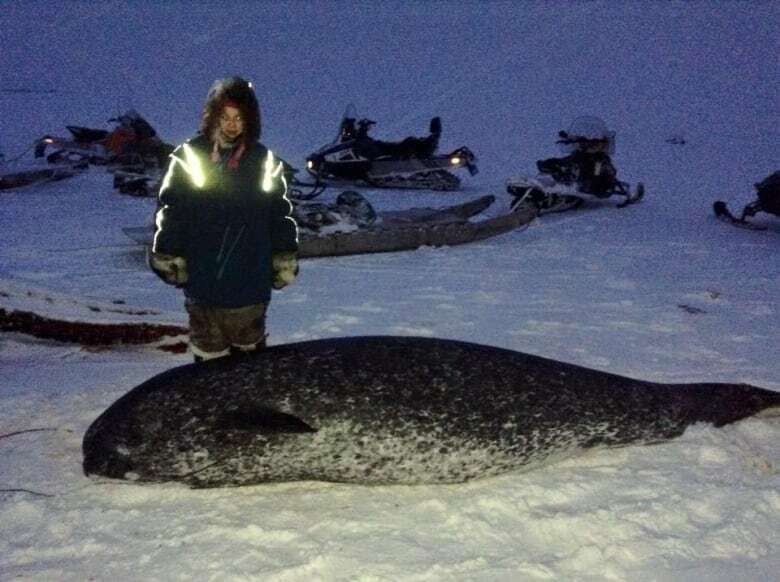 Hunters in Pond Inlet, Nunavut, have harvested 230 narwhal that were trapped in ice and had no chance of survival. One hunter says the whales will feed the community until the spring. Hunters in Pond Inlet, Nunavut, have harvested 230 narwhal that were trapped in ice and had no chance of survival. A hunter first heard the whales under the ice in mid-November, according to the local hunters and trappers association. Then, about two weeks ago, hunters using hydrophones — microphones for listening to underwater sound — heard the narwhal and started the search for them. Pond Inlet Mayor Charlie Inuarak says the whales were ice-locked and there weren't enough breathing holes for the large number. "These whales were just waiting to drown and die," Inuarak said in Inuktitut. "It happened in the past years before, not too far from the community, after a polar bear hunter saw a number of them already dead." Inuarak says hunters have previously tried to make holes for trapped whales, but could not keep up. The Nunavut Wildlife Management Board said the narwhal got stuck when the sea ice formed in the area and they had no chance of survival. Due to the size of the cull, the community's Mittimatalik Hunters and Trappers Association had to come up with a plan to harvest the whales in the most humane way. The harvest plan was approved by the Nunavut Wildlife Management Board and federal Fisheries and Oceans Minister Hunter Tootoo. Inuarak said not one narwhal was hunted until the community received approval for the harvest. Brian Koonoo was one of the hunters who heard the narwhal two weeks ago and says it's a relief that they were finally found and harvested. In Facebook posts, Koonoo said hunters were dealing with –50 C windchills, limited daylight and a huge search area. "We finally found them about 60 kilometres from Pond Inlet," he said in Inuktitut. Koonoo said there's enough maktaaq to feed the community until spring. They're also planning a feast Friday night with the fresh whale skin and blubber, as well as seal. In all, more than 260 narwhal were caught in the ice — 230 were harvested, 15 were lost and 18 were hunted by polar bears. In 2008, more than 500 narwhal were harvested near Pond Inlet after they were trapped by sea ice.